During the past several years, the Village of Willowbrook has said good-bye to several longstanding businesses. The lure of the “blue light” special ended for local shoppers when the Kmart at 840 Plainfield Road closed its doors in 2013. Three retail sites: Pete’s Fresh Market, Steinmart, and Ulta will replace the former store. Dominick’s, which had been in business at 63rd Street and Route 83 since 1987, shut down in 2013 as part of Safeway’s restructuring, and Whole Foods relocated its store to the vacant building. Pizza lovers mourn the loss of Phillies Pizza, which closed on November 21, 2015, after 29 years of serving pizza to locals. The increase in rent at the renovated Hinsdale Lake Commons shopping center was too much for the business. When owners Liz Hulka-Vena and Michael Vena decided to retire, they had hoped to sell their enchanting horse farm and entertainment business to someone who shared their love of horses and animals. With no takers, Pulte Home Corporation purchased the property and built 29 homes in the upscale Carrington Club subdivision. Liz Hulka-Vena grew up on the property and purchased her parents’ produce farm in 1980 to create her dream of woning a horse farm and training center. Read more about the history of Arabian Kinights Farms and view photos. on Flickr. In July 14, 2016, the popular Willowbrook Lanes at 735 Plainfield Road closed unexpectedly due to the owner, Lou Viren Jr.’s, illness. The iconic sign with the large bowling pin said “Closed, Thank you for the memories.” Tyler Hook, who grew up bowling at Willowbrook Lanes, quickly contacted the owner and paid over $5,000 for the giant bowling pin sign to add to his collection. [Fornek, K. (2016 September 8) Soon there may be no sign of Willowbrook Lanes. Chicago Tribune. chicagotribune.com] Bowlers sadly stopped by to pick up their gear and say good-bye, and summer leagues had to find another bowling alley to finish the season. A mainstay of the local bowling scene, Willowbrook Lanes also included Hinsdale South High School’s boys and girls bowling teams who practiced at the Lanes and played their home games at Willowbrook Lanes. The owners actively supported local organizations and causes including hosting a bowling party for the library’s Volunteen’s in 2008. 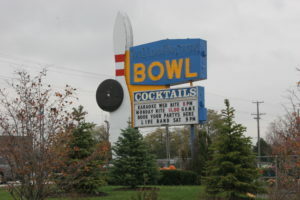 At the time of its closing, Willowbrook Lanes had 24 lanes, as well as the Willow Lounge that served beverages and offered live music every Saturday night. You can view images of Willowbrook Lanes from YouTube. If you have photos or stories about Willowbrook Lanes that you would like to share, contact Mary Krekelberg, maryk@ippl.info.